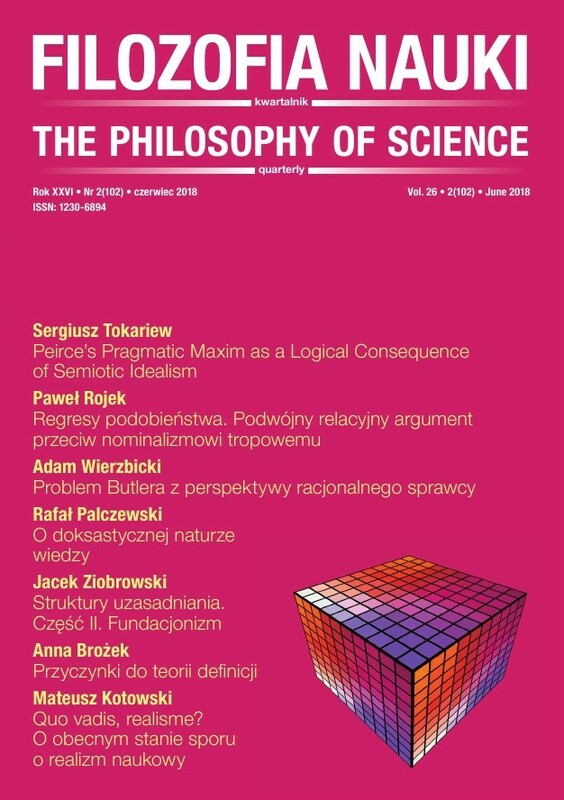 The purpose of this paper is to show that the pragmatic maxim can be construed as a logical consequence of semiotic idealism. Peirce proposed his semiotic idealism in the 1860s and based it on two premises: first, that we could know only symbols and, second, that the only things that exist are those that could be known. From these premises, he concluded that only symbols exist. This conception was meant to refute the distinction between the substance and its phenomenal manifestations. If semiotic idealism implies the pragmatic maxim, then it becomes clear why the pragmatic maxim says that the conception of the effects of the object is the conception of the object: it is because Peirce thought that the effects are the object. Furthermore, the close link between these conceptions may account for Peirce’s prolonged silence about pragmatism. Peirce C. S. (1982-), Writings of Charles S. Peirce: A Chronological Edition, vol. 1-8, M. Fisch et al. (eds. ), Bloomington, IN: Indiana University Press. Apel K.-O. (1995), Charles S. Peirce: From Pragmatism to Pragmaticism, trans. J. M. Krois, New York: Humanity Books. McCarthy J. E. (1984), "Semiotic Idealism", Transactions of the Charles S. Peirce Society 20(4), 395-433. Murphey M. G. (1993), The Development of Peirce's Philosophy, Indianapolis–Cambridge: Hackett Publishing Company. Parker K. A. (1998), The Continuity of Peirce's Thought, Nashville: Vanderbilt University Press. Savan D. (1983), "Toward a Refutation of Semiotic Idealism", Semiotic Inquiry 3, 1-8.